I had 72 hours to make a game when I participated to indies vs gamers this weekend. The PeacefulForest is my entry into the jam. My game presents a small patch of forest that has been inhabited by man-eating spiders. The spiders hide and hunt the player. 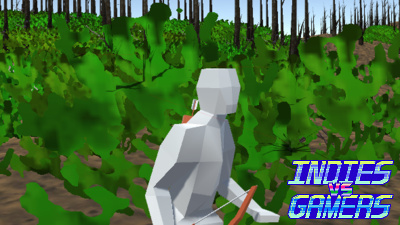 The player is tasked to find, pursue and kill the spiders as fast as possible while avoiding the instadeadly bites of the spiders. The inspiration to the game originates from an another video game Forbidden Forest that was released in 1985. While doing the game I had to watch several unity guides through to get the crucial elements that form the game. I learned whole lot here, practically the basics about animating 3D characters for computer games. My sister helped me by modelling and rigging the spider, but I did the same for the archer myself. She also animated half of the actions in the game. Blender turned out to be quite messy tool to use for that. I used the Krita to draw the textures for terrain and trees. The game is missing sounds or music. After publishing the game I have discovered about 8 things that need attention after the competition. I negligently mixed up the values for minutes and seconds in the scoreboard. Linux builds show some input handling issues on my main computer. The same appears in another gamejam build so it may originate from gamejolt API or Unity5 itself though. I'm wasting an extra button for releasing an arrow the player can shoot. This makes the game less accessible for some people, especially with bad keyboards. The goal was to make an arcade game, although everything were arcade at some point, I don't think my game entirely fit the description. From the day 1, I considered the need to market and represent the game along producing it. Rather than concentrating on coming up with a great idea, I concentrated on what could be fun to play. I did autonomous agents recently so I ended up with spiders. I managed to scope down my initial concept into something that could be implemented with my knowledge in given schedule. I picked up the right tool for the job. Unity tends to only stand in the way if you want fancy things, but for quick conceptualizations it is a fine piece of tool. I took the advantage from the unity by providing 7 different builds for 4 different platforms. I considered the construction of the only level in the game as a design and composition problem. I picked some screenshots and provided a gameplay video. I considered how people would find the game and what would be required to get them to play the game. I wrote this self-reflective memo blogpost and cataloged down the bugs I have discovered this far. I drilled down into every artistic problem by deciding the largest details first and then drilling down to the smaller details. It didn't turn out to be as great as it was in my visions, but I published it anyway. Why did I do it? The jam is being presented by people who have millions of youtube subscribers on their channels. Victory or possibly even just proper participation could provide massive visibility that could make it less effort to market my future game titles.